Arsenal are reportedly preparing an offer of £89 million for French star Ousmane Dembele. It is believed that Unai Emery has told Arsenal board of his wish to add the youngster to the club. Dembele has been repeatedly linked to the Emirates despite the influx of new signing this summer. Dembele was recently pictured with Aubameyang and several Arsenal players dining at the Emirates leading to wide speculations of an impending move. Despite this furore, the player cut short his holiday to resume training with Barcelona last week. However Barcelona based paper Mundo Deportivo claims that Arsenal’s still have interest in the Wideman and are set to make one more tantalizing offer. The report claims that the Gunners have tabled a loan bid of £8,9 million with an option to make the deal permanent next summer for £80.3 million. Dembele had an underwhelming spell at Nou Camp last season struggling with injuries and poor form despite the Catalans winning the double. The recent arrival of Brazilian Malcolm from Bordeaux has also increased the level of competitions for the first team position. 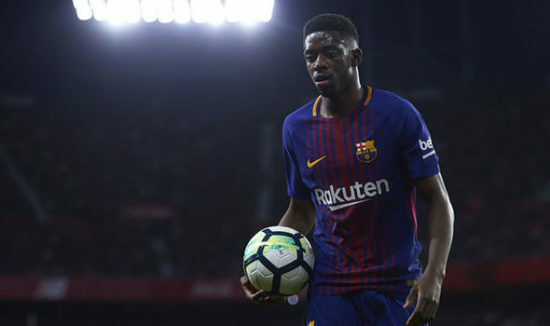 Also, Dembele feels that Barcelona manager Ernesto Valverde lacks trust in his abilities despite the tactician saying otherwise to the Media. Arsenal are hopeful that this offer could tempt Barcelona to release the player on a season-long loan. Dembele arrival would make the Gunners attack tantalizing with him lining up alongside Aubameyang and Lacazzette.